You wouldn't think it, but men are actually more inclined to read instruction manuals before setting up electronic goods and gadgets than women are. Two thirds of men (67 per cent) said they are careful to read the instruction manual before setting up devices such as DVD players and TVs, whereas only 62 per cent of women said the same. 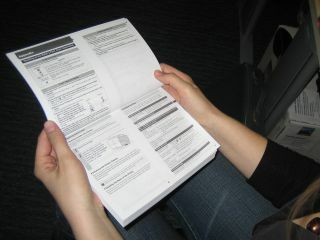 The survey, commissioned by mobile price comparison service 60207 , also found that younger people are less likely to bother with instruction manuals. Over half of 16- to 24-year-olds (53 per cent) said they never look at instructions, whereas 76 per cent of 55- to 64-year-olds said they always do. Nick Mearing-Smith, managing director of 60207, said: "Although most of us do head for the manual at some stage, it's men rather than women who need the most help when setting up their new toys." Some 1,000 people took part in the survey.